When I first heard that Line planned to change the Pandora for the 2013-2014 season, I was pretty devastated. Over the last several seasons, the previous version of the Pandora (115mm underfoot) has remained one of my favorite, versatile powder skis. I’ve spoken to dozens of ladies about the ski, everyone seems to agree that it rocks, and the previous Pandora is one of the most common women’s skis I see at resorts. While the earlier Pandora is also fun, playful, and easy to handle in powder, as well as everywhere on the mountain, I suspected the new version’s narrower waist, more heavily tapered tail, and new core construction would yield a notably different ride. 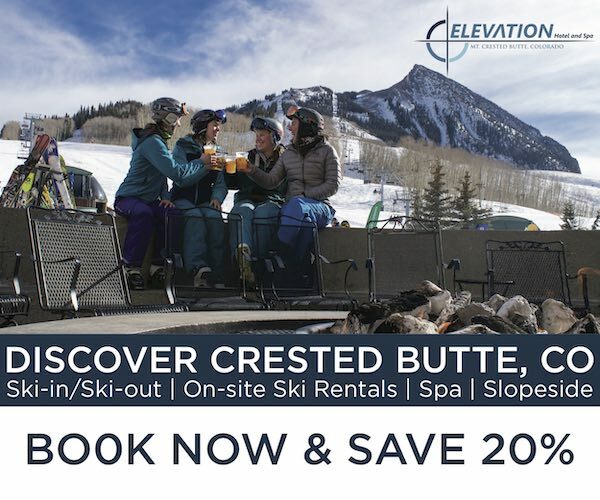 I arrived in Crested Butte, Colorado just after the mountain received several feet of new snow over the course of a week, and the snow stayed soft for the first few days I skied the Pandora. Although I had been somewhat skeptical of the changes made to the ski, I loved the new Pandora from my first run. I started out on a few groomer laps, which became progressively more bumped and roughed up throughout the day as a result of the new snow. As soon as I got the Pandora up to speed and leaned into a carve, I felt the ski respond with the familiar, playful bounce characteristic of the former Pandora. The light weight of the ski made it easy to throw out from under me and quickly transition from one turn to the next. The Pandora’s new, narrower waist also contributed to a more intuitive feel while carving, and its ability to get up on edge and remain there through the completion of the turn was impressive. The Pandora did not feel as outstanding as the Salomon Stella (104 mm underfoot) through a carve, but high angle carves were still quite easy to initiate. Even on days where the snow firmed up but was also slightly bumpy, I never experienced the Pandora’s tails washing out and felt the ski provided a good edge hold (albeit with a fresh, good tune, and I was not skiing on East Coast ice). Given the ski’s relatively short sidecut radius and length, the Pandora preferred small-to-medium sized turns on groomers; however, I still felt comfortable at high speeds on consistent and mildly bumpy snow. The Pandora does not have the heavy, damp feel of a ski like the Blizzard Dakota to completely smooth out variable snow, but it was predictable enough that I wasn’t worried about tip deflection and excessive chatter. The Pandora wouldn’t be my first choice to take full speed down bumpy hardpack, but for the most part, it can hold its own in a range of on-piste conditions. In the soft, deep chop that lingered for several days after the end of the storm in Crested Butte, I really appreciated the Pandora’s light weight and maneuverability. I could easily and quickly work the ski through bumps and troughs, in between consolidated piles of snow, at medium speeds without the shovels folding on me. The playful quality of the ski made these soft, tracked-up conditions quite fun. The Pandora’s softer tips helped the ski plane nicely on longer run-outs through deep chop, but the shovels sometimes felt too light to drive fast down the fall line in thicker, heavier snow. 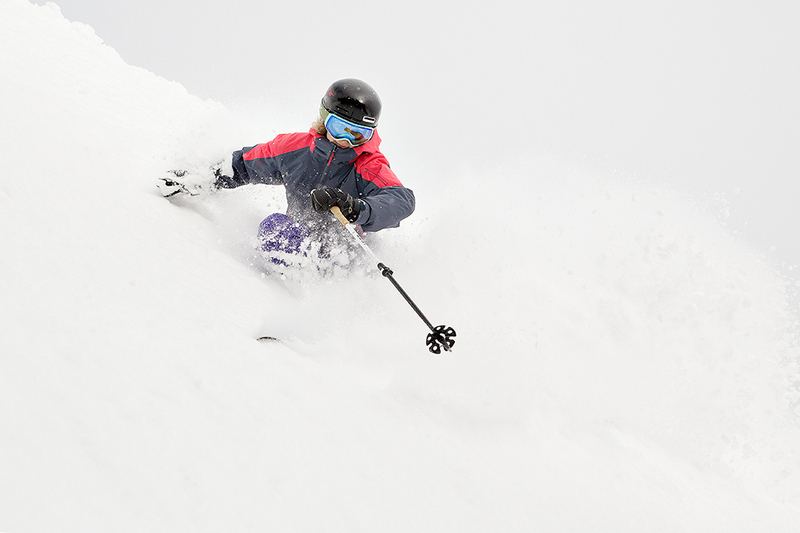 In this way, the Pandora probably won’t satisfy those looking for a serious hard-charging, big-mountain crud ski, but with a few added turns across the hill, it can still be skied aggressively when conditions become more demanding. Crested Butte’s steep, techy terrain is where I spent a majority of time on the Pandora. The ski’s light swing weight allowed me to easily navigate some of the tighter chutes and tree sections. Hop turns and precise changes in direction were easy, so as some areas got tracked out, I could make fast, dynamic turns through bigger, defined bumps. Some of Crested Butte’s technical zones end in small mandatory airs; here I found the Pandora to be both supportive and forgiving. Even though the ski felt nimble in the air, the Pandora provided enough of a sturdy platform to stomp small to medium sized drops. At the same time, I could also quickly shut down my speed in the run out if I needed to. The Pandora floated beautifully in a foot of light, untracked powder at a crowdless Monarch Mountain. Although the ski doesn’t seem to provide quite as surfy of a ride of the earlier Pandora, which was fatter underfoot, it was still incredibly fun to make fast, fluid turns down open and gladed runs. The skis’ wide shovels and generous splay prevented any tip dive, while the Pandora’s gently rockered tail prevented it from having the super loose feel of a more dedicated pow ski with more pronounced tail rocker. In this way Line has compromised some of the Pandora’s float with the new design, but this slight change in powder performance is made up for by its impressive versatility elsewhere. The Pandora’s flex pattern feels well balanced, especially in powder. I have noticed that on some skis (the Salmon Stella, in particular) that have light, rockered tips and relatively stiff, flatter tails, it often feels like there is a lot less ski in front of you compared to behind the boot. This can create a sometimes unpredictable sensation in variable and powder snow. But while I occasionally felt the tails of the Pandora catch in heavier chop, in general, the ski has a nice, consistent, progressive flex that rarely feels unbalanced. The new Pandora is an incredibly fun, well-designed ski that will appeal to a lot of skiers. 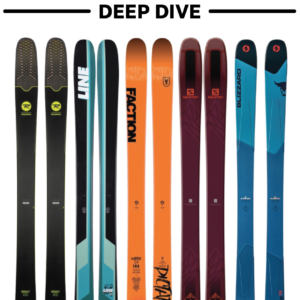 Although I am sad to see one of my favorite powder skis go (the 115mm underfoot Pandora), I believe this new iteration will work for more people across a wider range of conditions. The new Pandora offers slightly less float than the old version, but it is a more capable carver that holds its own in soft and firm conditions. The ski’s light weight would also make it a great touring option. Advanced to expert skiers looking for a playful all-mountain ski, or even a dedicated powder ski, should seriously consider the Pandora. I applaud Line for not only making a longer, 179cm Pandora, but also for making another new ski that I love. You can now also read Blister reviewer Sascha Anastas’ 2nd Look at the Line Pandora 110. Do you think that for a girl 13 years old (5.4 x 95lb) the 172 is too much? What is her ski background and ability? Has she been on other skis that long before? Thanks for reading! 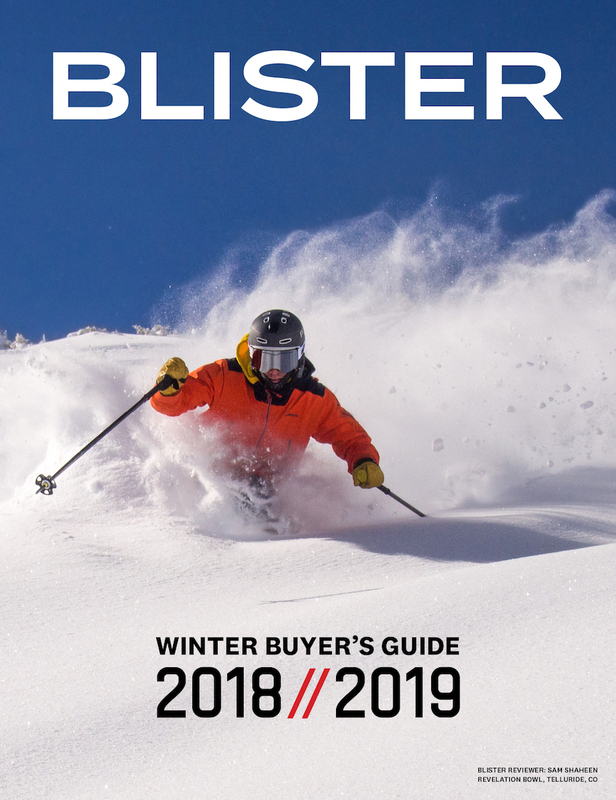 It’s interesting that Blister says the Pandora is exactly the same ski as the Sickday 110 with a different topsheet. The official Line promotional video clearly takes the marketing line that this is a ski designed specifically for women (see link below). When you compare the specs on the Line website the skis do appear identical so I am with Blister. Should Line not own up and admit that the Pandora is the same ski as the Sickday 110 ? What’s wrong with that ? It doesn’t make it any less a ski. 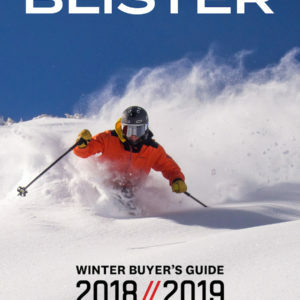 Let’s see here – Blister says the Pandora is the same as the Sickday 110 and they just interviewed Line’s ski designer Jed Yeiser. Even I can put 2 + 2 together. I’m 165cms, weigh 70kgs – advanced to expert skier and currently riding on 170cm Volkl Kenjas. Thanks for reading! 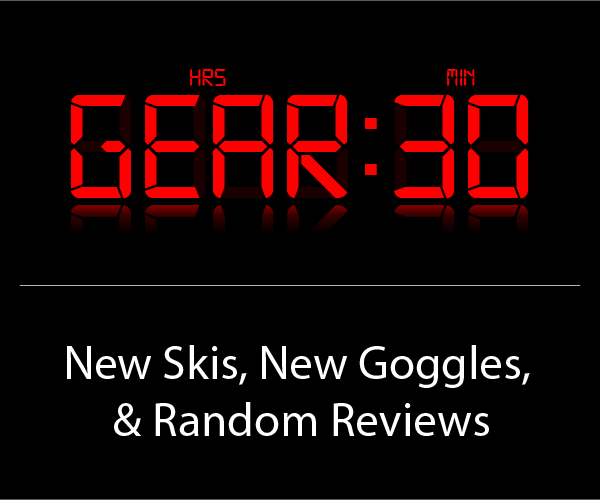 If you’re looking for a powder-specific ski, I think the Pandora would be a lot of fun, but there are some other skis (especially with a bit more tail rocker) that I’d also recommend checking out. The Moment Bella would also be a fun option, though I understand you may want to go longer for a pow ski. The Nordica La Nina is a blast in soft snow, and does really well in other conditions as well. The Line Mr. Pollard’s Opus is one I’ve skied in Japan that floated beautifully in deep powder, as did the Volkl Shiro. 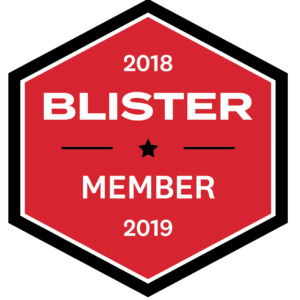 We have reviews for all of those skis on Blister, so check them out and let me know if you have any additional questions! I hope you’re enjoying Hokkaido! I’m an expert skier, my weight is 55kgs and i’m 166 cms. what do you recommend? 162 cms or 172 cms? Hey Teresa, I am about the same height/ weight (54 and 165) and I ride the 172, if that helps. We are right around the same weight and height too, and if you’re an expert skier, I’d definitely recommend the 172cm length. I don’t think it would be too much ski for you, and like Johnny said, they are actually a bit shorter than 172cm. Thanks for reading! Teresa, I just bought a pair of the the 13/14 in 172 for my 5’2″ 120b Wife. I measured straight pull tip to tail and the 168cm reported by Blister is dead on. I can’t wait for some snow here at Loveland so she can break these out. Other websites are claiming that the new 15/16 Pandora 110s actually have changed from previous years. They’re saying they now have a full Aspen core instead of the Maple underfoot… making them lighter than last year. … how much change is this gonna make in how it skis?